September 29, 2015 - 1 comment. When worship leaders reach out for coaching wanting guidance or input on their worship ministry, one of the first things I ask about is regarding the use of catalogs. Most are familiar with the concept but pick songs for their congregation with little attention to frequency, consistency, or breadth. The top 10 CCM songs are not a thoughtful or even helpful way of choosing songs for Sunday. Using a catalog hlps your congregation, your musicians, and is a great tool for worship leaders to balance the “worship diet” of their church. 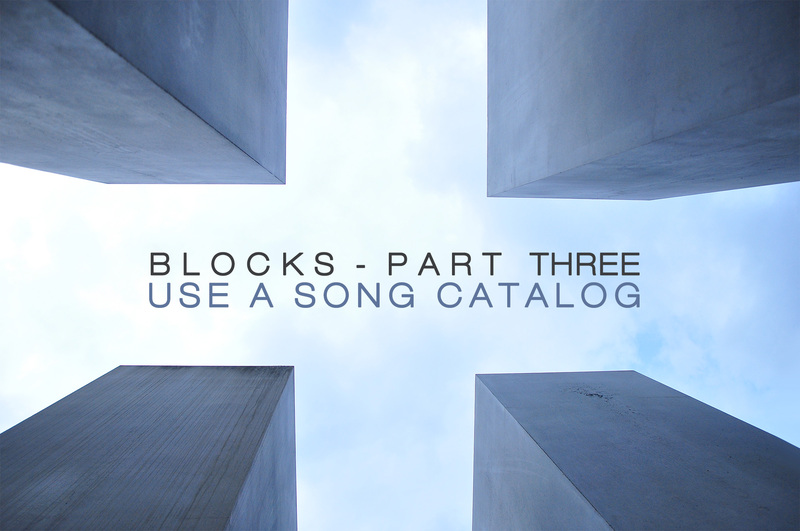 A catalog is a set bank of songs used for a set period of time at a set location that balances the worship diet of your congregation. For example, we use a catalog that changes every 3 months, of around 25 songs at Doxa. 1. It’s helpful for your congregation (and guests). It’s very hard to encourage participation in the congregation if they are constantly learning new material. They need to have several reps of the same song before it becomes familiar to them, and this happens long after the musicians (because we’ve practiced it several times for every single time they hear it on a Sunday). In addition, if someone new comes to our church for several weeks in a row, we want them to begin to recognize the music and feel an active part of our gatherings. Our songs are a part of our shared culture and language. We say, “a guest should recognize several songs if they spend a month with us”. 2. It’s helpful for your teaching pastor. In many churches, the teaching pastor has ten times the theological training that the worship leader does. This is highly problematic, but that’s another post for another day. Giving your teaching pastor a voice into the songs you use for Sundays is a great checkpoint, especially if they aren’t musically inclined. Using a catalog can help you work on the worship menu together and gives you a fighting chance at tying in the music with upcoming teaching themes. It also allows for your teaching pastor to request songs more easily when he has the catalog in hand. The benefits for planning services with a catalog are numerous. 3. It’s helpful for the worship leader. Every worship leader has a certain number of songs they could play at any moment. There are another group of songs that with a quick glance at a lyric sheet you could pull off. Still other songs would require the chord chart to be in front of you and several practices. This is true because depending on many factors, you only have so much memory recall to allocate towards the songs you are playing. If you utilize a catalog, you can prepare smarter. Rather than just prepare for the looming Sunday, use rehearsals to play through a portion of your catalog. This can mean it’s never been more than a few weeks since you’ve played an active catalog song. I can’t overstate how helpful this is. This saves time previously spent trying to remember that one tune you haven’t played for months. It creates space in practices for praying together, writing and creativity with your band or team, not to mention polishing the songs that need a little extra work. 4. It helps with a balanced worship diet. A warning: many have moralized (or demonized) different categories of songs in recent years, which speaks to both an ignorance of the Psalms as well as church history. Yes, let’s sing about what God has done and who He is. But giving language to our response is essential to. The common notion that all the old songs were rich and godly, and the modern contributions to praise music are empty and man-centered is problematic. For example, in the hymnals I have collected from the 1800s, the most common first word found in the song titles is “I”. Balance is key. These are only some of the benefits but it’s clear to see that catalogs are a incredibly useful tool for worship leaders. Create one from scratch or use PCO, but figure out a way to implement a catalog for greater clarity and intentionality in your worship ministry. You can download a sample of one of our catalogs here. I’ll post next week on how to build a catalog, so watch for that. What benefits or challenges have you seen? Comment below.